Hello, my name is Melinda Joy and welcome to my portfolio. I am a senior this year graduating from the School of Community Health. As part of the University Studies experience at Portland State University I had the opportunity to truly engage my community and develop the skills I needed to be an effective agent of change. Through the Leading Social Change cluster and this Effective Change Agent Senior Capstone I went outside my concentration of study and explored meaningful ways of impacting society as a whole. I had the chance to create lasting change by first recognizing the social responsibility I have to my own communities and then moving forward through everyday acts of leadership, which is how I first became involved with the Oregon Student Association. OSA is a student led, run and directed association. Their goal is to help keep higher education both affordable and accessible for all Oregonians. Established in the 1970's, the Oregon Student Association has been winning victories for students in higher education for 40 years. How is this done with over 120,000 members across the state? A ton of student Power! 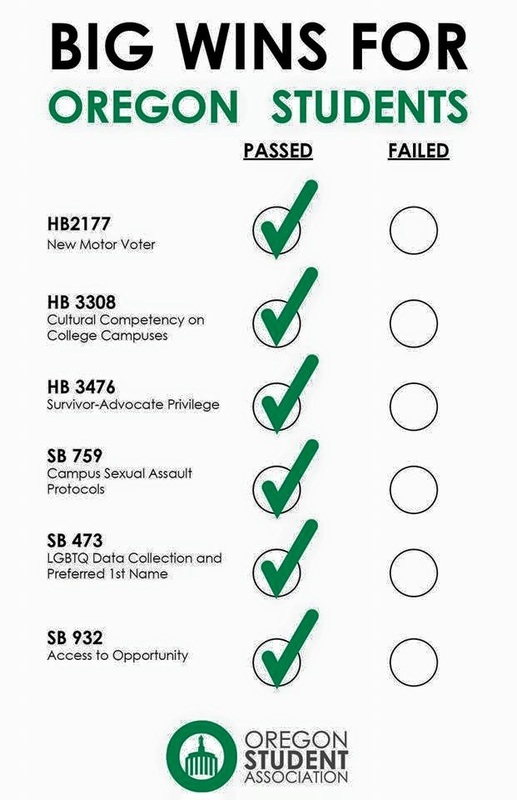 Almost all of the win's in the legislature are the direct result of student power and the campaigns being run on campuses all across Oregon. OSA has been able to win some of the largest victories for students because of the focus on the student vote, grassroots organizing, training and supporting student voices in the legislative process. The Oregon Student Association is a unique organization in that unlike most nonprofits it is led, run and directed by student leaders. Employing a professional staff to execute the day to day operations OSA allows students to steer the organization by selecting the issues, strategies and outcome of everything the organization does. This ensures the needs of students are of highest priority! At the end of every long legislative session students all across Oregon gather together to begin the extensive and arduous issue choosing process. Starting in August with the OSA Summer Retreat any student from a member school may propose, debate, and vote on proposed “issues” to address as a statewide student association. Out of dozens of proposals, ten are selected by the member students at the retreat. Over the course of the fall term, campuses engage as many students as possible in a state wide survey proposing the selected issues to work on. After the surveying is complete, OSA staff does research on the policy implications and feasibility of each campaign proposal and on the in-depth information on the survey results. With this information in hand, the OSA student leadership selects its issues for the coming year. I chose OSA as my community organization to collaborate with on my senior capstone project because I knew partnering with them would allow me to gain valuable hands on experience in grassroots organizing for policy change. Through my work with them over the last year I was provided the additional support needed, as a community health educator, to engage students in tough conversations with our communities about cultural competency, campus safety, and preventing sexual assault. With the help of this Capstone experience, the Oregon Student Association and all of the student leaders across Oregon I learned how to mobilize the communities and the resources needed for lasting social change.